Ask fellow campers about "Devil's Backbone Park Campground" and nearby attractions. Nice new clean park. Gravel sights are fairly level but were laid out odd for our fifth wheel that has the docking station near center of the camper. I'm glad I followed the suggestion to bring extra water hose and electric cord. It ended up we didn't hook up to sewer until we were ready to leave and then we had to move the camper closer to the outlet and dump. You also have the option of parking awning to awning if you are camping with a buddy. Overall we enjoyed our stay and will camp again. :) We camped at Devil's Backbone Park Campground in a Fifth Wheel. The little town of Nellysford is close by and has a grocery store, Dollar General, Post office, hardware store and auto parts store. There is no tv signal and cell signal is very weak so bring books and games for you little ones. Stayed at DB's Campground for a short weekend visit (24/25 Aug 18). This is a fairly new CG as it just opened in June. There are 25 pull through sites with full hook ups, 21 sites with just electric (I think), and 24 primitive sites. Most sites, unless maybe the primitives, are gravel and appear to be fairly level. The pull through sites are long and share electric/water pedestals. This can be inconvenient as hoses and electric cables had to run under the trailer to reach hook-ups. Bring extra cables and hoses to be safe. The picnic table is at the end of the site. But the tables can be moved, so not a huge deal. There's also very large fire ring which cannot be moved. There's currently is no cable or wifi. TV air reception was essentially non-existent and our Verizon wireless signal was weak at best. There's on bathhouse/restroom that isn't terribly large, but they're looking to add a second bathhouse in the future. It wasn't the cleanest I've ever been in, but wasn't the worst by far. The attraction for this particular CG is the Shenandoah Valley. Lots of hiking trails and biking (both road and mountain bike). Another attraction is, of course, the Devil's Backbone Brewpub (look it up on-line, it's awesome). You check-in at the retail shop by the Brewpub. There are two entrances to the Brewpub, one on Rt 151 and Rt 664. So, if you enter the parking lot and find it hard to turn around to exit, simply drive straight through and you'll easily get back on the road. We'll visit this CG again. 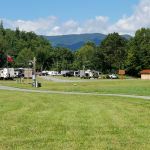 We camped at Devil's Backbone Park Campground in a Travel Trailer. 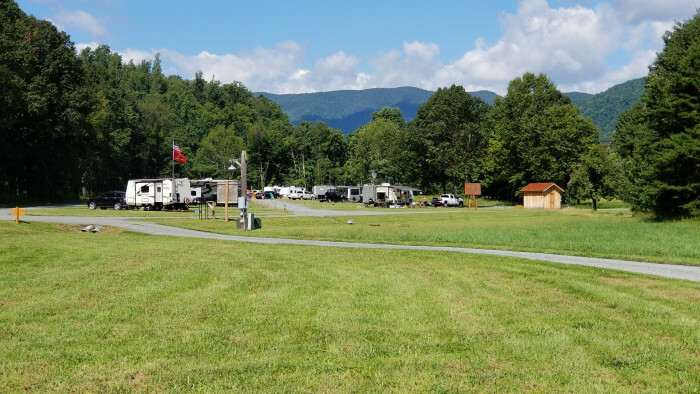 Are you affiliated with Devil's Backbone Park Campground ?